Two days of plant walks, wild food cooking, herbal medicine making, botanical identification, primitive skills and MUCH much more! 1125$ for all 5 retreats! Payment plans and (first come first served) work trade positions available. Use the contact form at the bottom of this page if you have any questions. Ask us for more information on local lodging and camping options in the form below. These are "retreats" in the true sense of the word. A chance to escape to the forest and mountains, a chance to disconnect and reconnect with our deeper needs, connection with nature and each other, nourishing food and herbs, and a chance to hear what our souls need, what we might not have time to hear in our daily lives. This is a true opportunity for immersion, giving ourselves a chance to absorb traditional skills by being fully in it. We'll have two whole days to immerse ourselves in plant walks, wild food cooking, botany and plant identification and plant education. This is all in a breathtakingly gorgeous rural setting in the Appalachian Mountains backing up to Pisgah National Forest. Tickets are $250 per person which includes a simple lunch both days, foraged dinner Saturday, all the herbal tea you can drink, and all materials. Lodging available nearby and camping onsite. Contact Abby for details. Whether you are one of the beshroomed or just mycocurious, this immersion into the mystical and veiled kingdom of fungi will not disappoint you! This magical experience will start with an informative and lively lecture that is designed to introduce fundamental concepts to the fungal uninitiated. We will introduce simple distinctions surrounding the elusive kingdom of fungi, and quickly branch into various and diverse applications for medicinal mushrooms. While several concepts will be introduced for the audience’s consideration, a focus will be placed on clinical applications of using medicinal fungi in herbal practice. Fundamental anatomy and physiology of the innate, acquired and primary immune response will be reviewed, and the known impact that mushrooms have on the human immune system will be revealed. We will review the most current and cutting-edge research as well as the ethnomycology exploring 5 distinct mushroom species, (Lion's Mane [Hericium erinaceus], Reishi [Ganoderma lucidum], Hen of the Woods [Grifola frondosa], Chaga [Inonotus obliquus], and Turkey Tail [Trametes versicolor]). We will discuss how herbal practitioners and clinicians may incorporate these functional foods into daily clinical applications and utilize them in herbal formulation. In summary, this course explores the lifecycle of mushrooms, how mushrooms impact aspects of immune function, dispels common mycophobias, reviews the basics of mushroom cultivation and medicine making, and illuminates several key species and their affinities of activity for specific body systems. The day will culminate in creation of an edible Garden Giant mushroom (Stropharia rugoso annulate) pollinator garden. Each participant will be able to take home their own ready to inoculate substrate to build their own edible ecosystem. The weekend will also include a plant walk with Abby, learning basic botany, plant identification, sustainable and ethical harvesting techniques, and cooking a foraged dinner together for a feast on Saturday night. Gina is an herbalist and an educator. 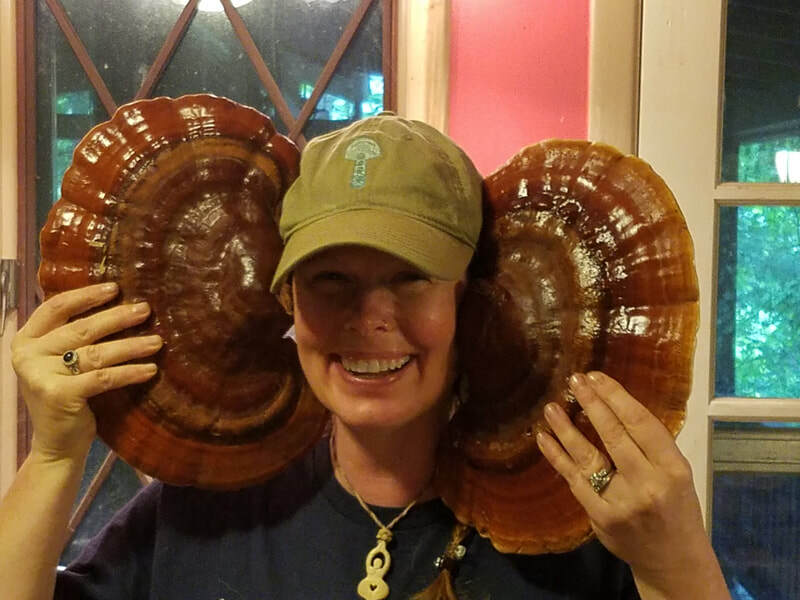 Through her work with the notorious mushroom enthusiast, Paul Stamets, Gina has traveled internationally training practitioners and the public on the health benefits of medicinal mushrooms. She has served as a community herbalist throughout the South, and currently resides in the Southeastern Appalachian Mountains. When not traveling and teaching, she focuses on cultivating medicinal herbs and mushrooms through sustainable organic farming practices. Teacher Bio: Gina is an herbalist and an educator. 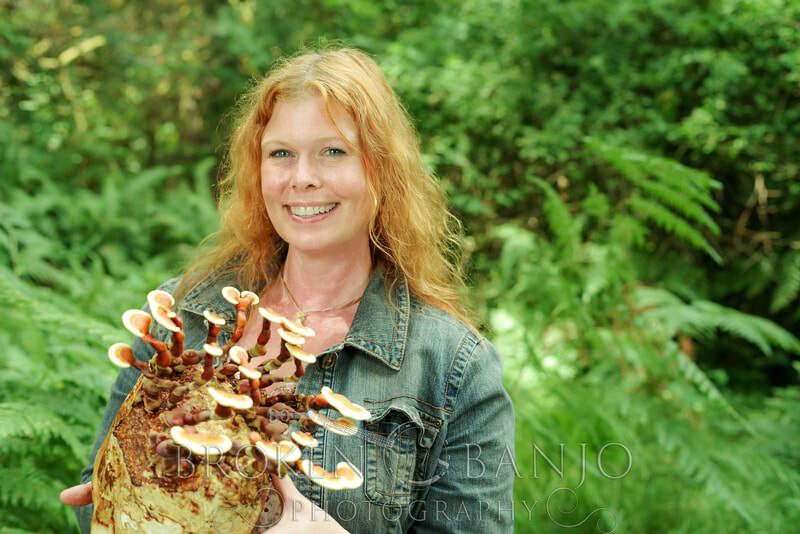 Through her work with the notorious mushroom enthusiast, Paul Stamets, Gina has traveled internationally training practitioners and the public on the health benefits of medicinal mushrooms. She has served as a community herbalist throughout the South, and currently resides in the Southeastern Appalachian Mountains. When not traveling and teaching, she focuses on cultivating medicinal herbs and mushrooms through sustainable organic farming practices. Trees with their towering shade providing habits and low growing fruit laden branches entice us towards them. We will lead you in this process of getting in contact with trees and learning many facets of their ecological roles and how to cultivate in a agroecology way. Our walks in the lovely forests of the mountains will allow for a multi sensorial experience and be packed with information. Once we have these foundations set, like the roots of an old oak, we will merge onto the age old tradition of tree planting. What a way to give back and we will develop a paw paw edge with guilds in a permaculture fashion. You will walk away feeling confident to plant trees, to forage their abundance, and know what they are telling us in the ecosystem. Teacher Bio: Trained as both a Permaculture Designer and Fish and Wildlife Manager, Doug has extensive knowledge surrounding landscape planning and food production systems. This regenerative design and implementation work spans the globe ranging in contexts and climates including tropical agro-forestry, Mediterranean organic gardening, and temperate suburban edible landscaping. To facilitate this work he founded TreeYo Permaculture thus building off his other formal training in small business management. Incorporating this knowledge and experience into sustainability educational programming has now become Doug’s main focus as he continues his ecological design and holistic development in various ecosystems. He now directs an eclectic project integrating socio cultural advancements with ecosystem stewardship at his family's land in Northern Kentucky called Treasure Lake. Teacher Bio: Kat Shaw is a trained Clinical Herbalist, Street Medic, and Wilderness First Responder whose mission is to connect people to nature and accessible holistic healthcare. She has hundreds of hours of clinical experience in places as diverse as Rainbow gatherings, Earthskills gatherings, disaster relief & activist camps, and free herbal clinics. She operates Gather & Give Botanicals, where she offers consultations, classes, and custom formulations as well as Asheville Street Feet Project, a free foot clinic serving underserved people in Asheville, NC. She studied with the plants themselves, and gained wisdom from the Chestnut School of Herbal Medicine, the Colorado School of Clinical Herbalism, Botanologos School of Herbal Studies, and the Herbalista Free Clinic. 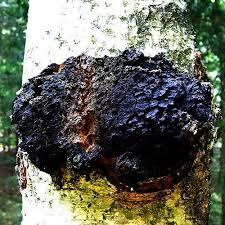 ​The acorn-bearing oak tree has long played a prominent role in human cultures around the world. 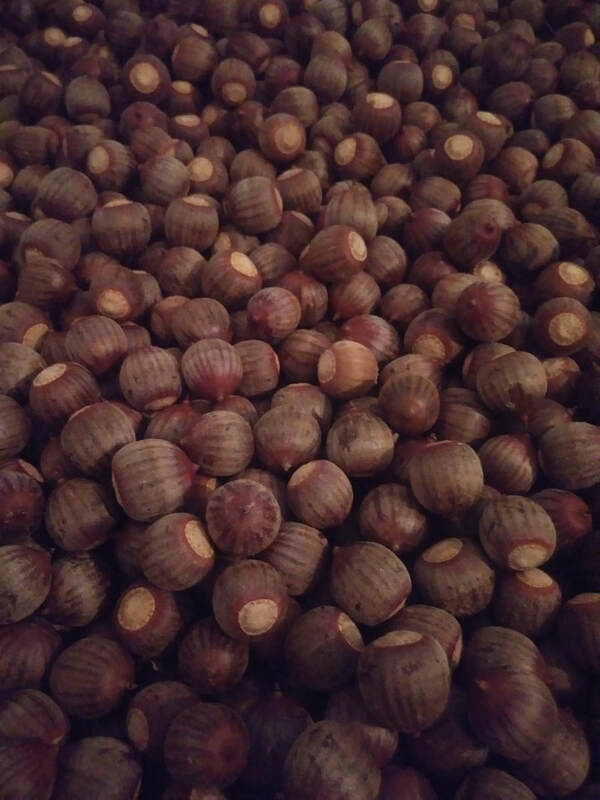 In many indigenous cultures, such as those heavily documented in Northern California, acorns have been an important staple food. 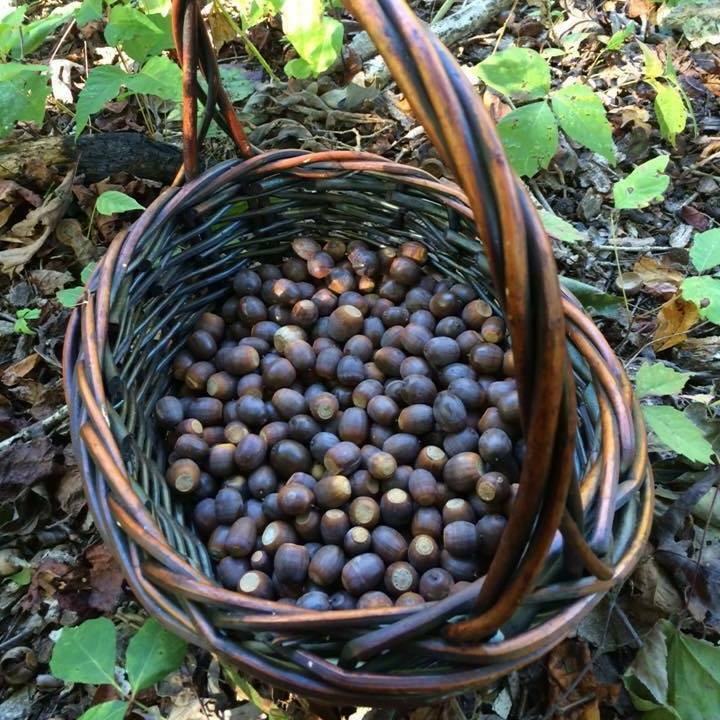 In modern times our relationship with the oak has been transformed: acorns are most often viewed as a nuisance instead of a highly nutritious and versatile food. 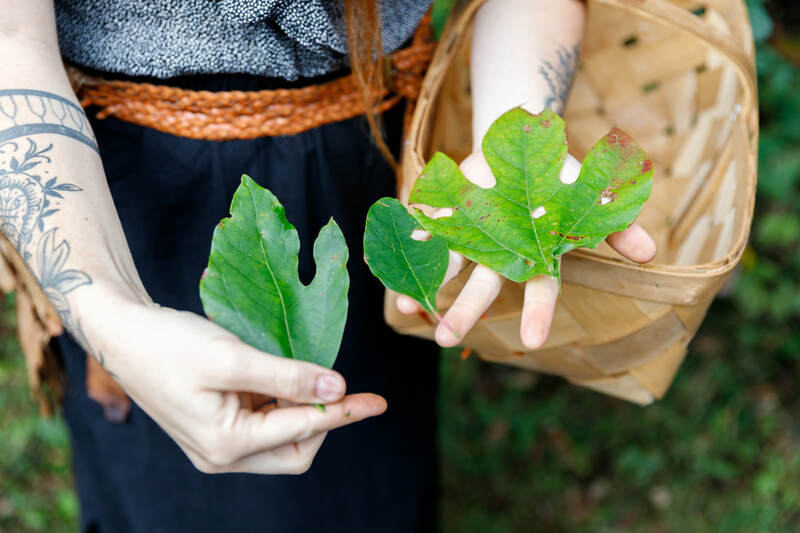 In these uncertain and perplexing times that we live in, rekindling a healthy relationship with oak trees and their food uses may be one of the most important steps we can take in strengthening our relationship to ecology and place. During our time together we will observe and discuss oak species common to the area and grasp an understanding of oak groups and their nutritional and culinary aspects. There with be a primary focus on transforming the oak nut (acorn) into nourishing food. Participants should expect to walk away knowing how to confidently 1) identify at least four different oak species, 2) differentiate between and understand considerations for the red oak group and the white oak group, 3) gather, process, and store acorns for eating, 4) obtain and use various processing equipment for gathering and processing acorns, and 5) create culinary crafts with oak nuts, such as grits and fry bread (recipes will be given). Teacher Bio: Alexander Meander is a feral homesteader, subsistence ecologist, and advocate of wildness. He is largely self-taught on a wide range of topics that, as a whole, “tend human biology through ecological stewardship”. Thanks to occasional extended camping trips with his eccentric father, Alex has eaten wild foods since he was a child. As an unorthodox Georgia-born 20-something searching for meaning, he moved north to the mountains and officially began an intensive self-study of plants and mushrooms in the early 2000’s. In 2006 he began a life-changing four-year residence as an intern and staff member at the Sequatchie Valley Institute in Whitwell, TN, a non-profit dedicated to providing research and education on sustainable living. Following a year out west in Washington state to recalibrate, Alex returned east, spending 2011 at the Blue Ridge School of Herbal Medicine as an apprentice to Coreypine Shane, after which he became a certified Holistic Herbalist with over 800 hours of study. 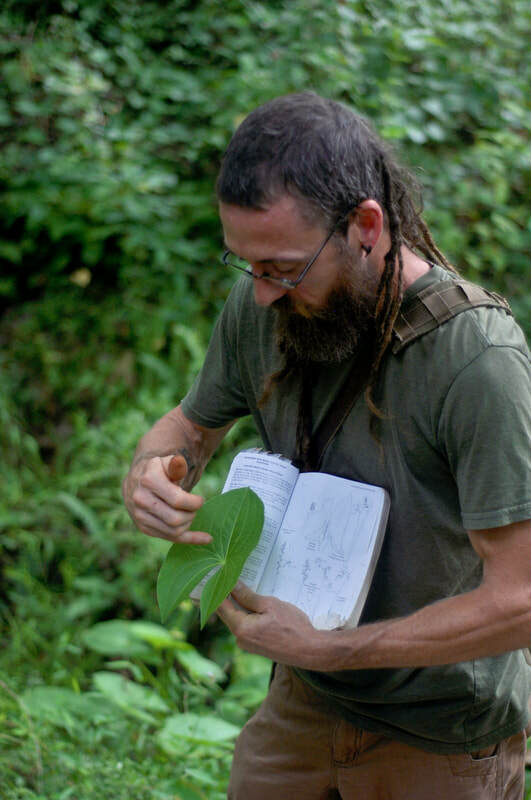 In the winter of 2012-13, he acquired his Permaculture Design Certificate with Permaculture in Action at Earthaven Ecovillage in Black Mountain, NC. In early 2015 he was a content editor for the second volume of Ancestral Plants, written by Arthur Haines. Through various outdoor classes and plant walks he elucidates the importance of wildness while demonstrating proper identification, gathering, cultivation, and preparation of wild foods and medicines. 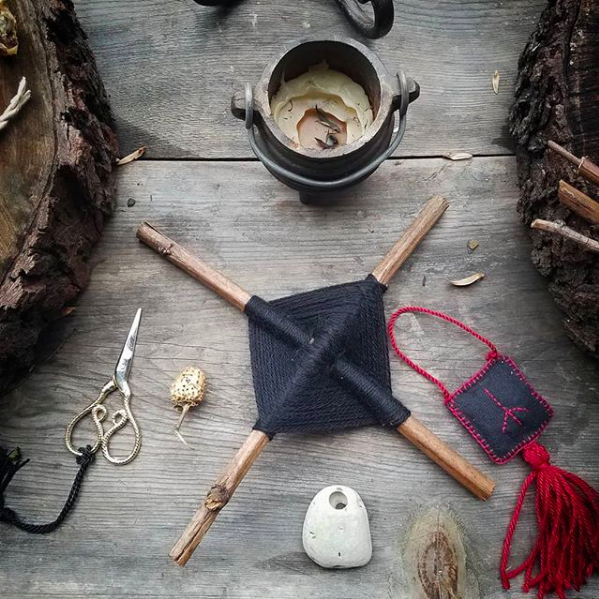 Becky Beyer of Blood and Spicebush will lead an exploration of the craft of the Hedge. Hedgecraft is the art of wortcunning; or knowing plants not just by their botany, but by the currents of magic that run through them. It is knowing how to find what you need to heal and nourish with that which flourishes just outside your doorstep. This class series will provide the student with a primer in the working knowledge of the cottage witch (or cunning person) in Appalachia. By learning to identify, harvest and craft folk preparations that our ancestors used to treat common ailments and maintain good health, we will better understand ourselves through our relationship with the land. Hedges once divided the wild from the tame, the forest from the fields. Walk the Hedge and see what grows within it. Reclaim the knowledge of mountain medicine through a plant walk focusing on the historical and folkloric uses of plants from the diverse and complex history of beautiful Appalachia. During our class time together we will begin to know the plants of this region through an Appalachian Folk Medicine plant walk, calling upon the stories of the plants we meet from the uses of the First Nations, to those of African Slaves and European colonists. Each of these unique and separate groups of cultures came together to form what we known as Appalachian, an to understand the story of Folk medicine, we must understand them. A salve, vinegar tonic and cough syrup will be crafted to heal and soothe our friends and family calling upon these healing legacies. Teacher Bio: Rebecca Beyer is a farmer, forager, herbalist, woodcarver, and witch from Asheville, NC. She holds a B.S. in Plant and Soil Science from the University of Vermont and has been learning and teaching in the Primitive Skills community for the last 6 years. 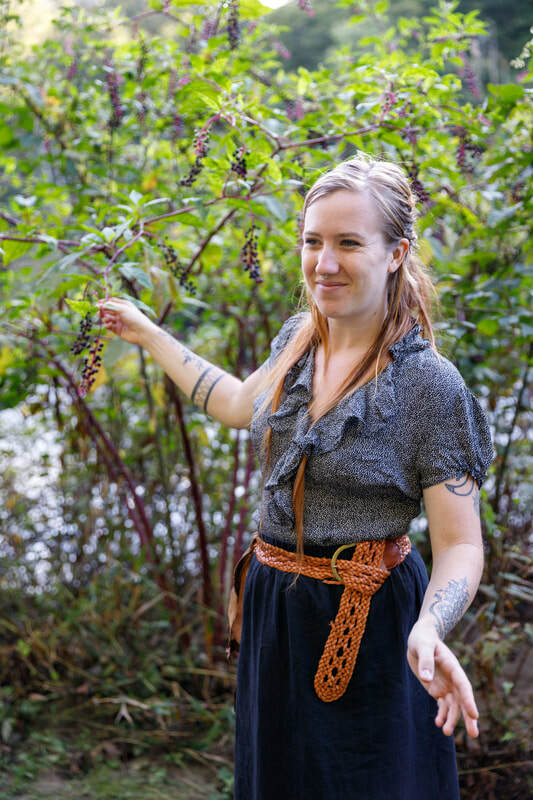 She teaches foraging professionally as well as Ethnobotany at Appalachian State University where she completed her Masters in Appalachian Studies in 2018. Her passions include botanical illustration, the folklore of Appalachian plants and writing her blog: Blood and Spicebush. She is currently stewarding land at the Hawk & Hawthorne, a community of magical people growing food and teaching classes on wild plant foraging and esoteric arts in Western North Carolina.